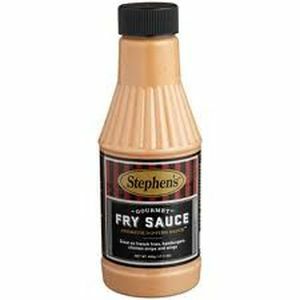 Fry sauce is a regional condiment served with French fries. Often referred to as "Burger Sauce". It is usually a simple combination of one part ketchup and two parts mayonnaise. When spices and other flavorings are added, it is similar to but thicker and smoother than traditional Russian dressing and Thousand Island dressing. Occasionally other ingredients such as barbecue sauce are substituted for ketchup, and other variations exist outside of the United States. Recipe for Fry Sauce see Here, Here, Here.